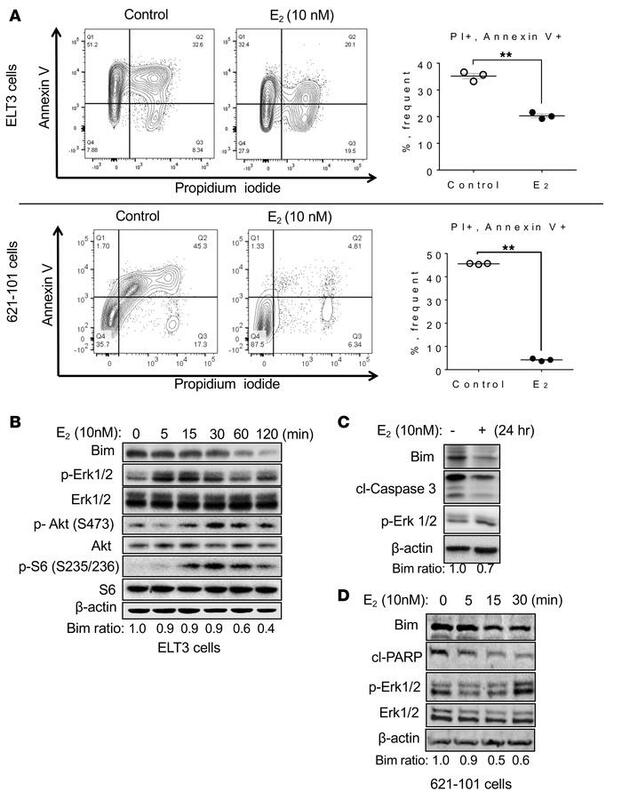 Estrogen decreases Bim expression in detached ELT3 cells and 621-101 cells. (A) Tsc2-deficient rat uterine leiomyoma-derived (ELT3) cells (upper panels) and TSC2-deficient LAM patient–derived cells (621-101 cells) (lower panels) were seeded in poly-HEMA–coated plates, and treated with 10 nM 17-β-estradiol (E2) for 24 hours. Cells were stained with a BD Annexin V: FITC Apoptosis Detection Kit I. Anoikis was determined by flow cytometry (BD FACSCanto II). Annexin V+PI+ indicated cells undergoing anoikis (n = 3). (B) Immunoblotting analysis of Bim levels in ELT3 cells treated with E2 for indicated periods. (C) 621-101 cells were treated with 10 nM E2 or vehicle control for 24 hours in detachment conditions. Cleaved caspase 3 was used as an additional cell death marker. (D) 621-101 cells were treated with 10 nM E2 for 5, 15, and 30 minutes in detachment conditions. Immunoblotting analyses of Bim, phospho-Erk1/2, Erk1/2, and cleaved PARP were performed. In B–D, β-actin was used as a loading control; Bim levels were quantified using densitometry, and normalized to β-actin. Results are representative of 3 experiments. Statistical analysis performed using an unpaired, 2-tailed Student’s t test. **P < 0.01 was considered significant.